President Remengesau Jr., the eighth President of the Republic of Palau, is the first Palauan to be elected as President three times. Over the past 2 decades in office, he has consistently demonstrated visionary leadership in protecting his nation’s unique marine environment, which is often referred to as one of the seven underwater wonders of the world. On Oct. 28, 2015, President Tommy E. Remengesau Jr. took bold action and signed into law the Palau National Marine Sanctuary Act, covering 193,000 square miles—an area bigger than California. The sanctuary will ‘fully protect’ about 80 percent of Palau’s maritime territory, a higher percentage than in any other country, where no extractive activities, such as fishing or mining, can take place. Fully protected marine areas provide a broad range of benefits by safeguarding biodiversity, protecting top predators, and maintaining ecosystem balance. And, the sanctuary also will help protect Palau’s waters from illegal fishing. A separate zone reserved for local fishermen and small-scale commercial fisheries with limited exports will cover the remainder of Palau’s waters. Marine surveillance experts from around the world are now collaborating with Palauan authorities on a world-class enforcement strategy to monitor this marine zone. The sanctuary will make it easier to identify and stop illegal fishing, because restrictions on commercial activity simplify detection. Highly protected marine areas are also up to six times more resilient to the effects of climate change than unprotected areas. During President Remengesau’s time in public office, Palau has been recognized for its financial stability, good governance and innovative ocean conservation initiatives. 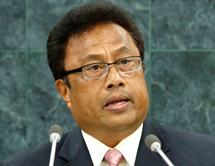 In 2006 President Remengesau entered Palau into the Micronesia Challenge, a joint commitment by the Federated States of Micronesia, the Republic of the Marshall Islands, Guam, and the Commonwealth of the Northern Marianas Islands to effectively conserve at least 30% of their near-shore marine resources and 20% of their terrestrial resources by 2020. In 2004 he was the first global leader to call on the United Nations to adopt a moratorium on high seas bottom trawling at the General Assembly, and in 2006 he enacted a ban on bottom trawling in Palau’s waters. In 2009 President Remengesau established the world’s first shark sanctuary. In 2010 he supported the creation of Palau’s first marine mammal sanctuary, and in 2012 Rock Islands Southern Lagoon became a UNESCO World Heritage site. President Remengesau has also been an outspoken leader on the international stage advocating for the need to address climate change, most recently in Paris at COP 21.